All building projects start with a need…"I’ve got to get more file space in my office.”…”We've outgrown our house." Many of us have thumbed through Architectural and Home Improvement magazines, articles and pictures have been dog-eared and cut out, put in files or stuck up on the walls of our homes and offices. We read the articles over, attempt to draw a plan by freehand (a rough sketch if you will) and make To Do lists. While many of us have the end result of our construction clearly fixed in our mind; the majority of us do not know where the process begins. We do not just how complex and intricate building and renovating can be - until we attempt to do it ourselves. Building is a lengthy procedure; which can also be very messy and very disruptive. Imagine the process as a web constructed of design options, geometrical building maps, building codes, contractors and town and country planning. If you get stuck here, then the procedure can also become very costly. Now, imagine someone with the required experience, accreditation and professionalism taking your hand and guiding you seamlessly through the process. Those who make the decision to hire an architect right after making their To Do list will never get stuck in the web. The guidance that an architect offers is manifold. This can include site studies for feasibility and environmental impact; helping with Town and Country approvals; securing the right contractor; producing detailed workings, drawings and specifications; identifying the nature and quality of materials required; preparing tender documents for contracts; project managing and helping to coordinate the work of contractors. Architects are basically hired to direct a project from start to finish. This would include continuing to make regular site visits to check on progress, ensuring that the project is running on time and to budget; resolving problems and issues that arise during construction; and ensuring that the environmental impact of the project is managed. Besides eliminating the stress of construction, an architect can also save you money. A project that is well-drafted can be built more efficiently and in turn, more economically. When an architect initially meets with you, one of the first things they take into consideration is your budget. From there they can help you select the appropriate materials and workmanship at a fair price. Architects stay on top of advances in roofing, brick work, floor tiling, paint finishes, etc. This allows them to instruct you on what materials and finishes are durable as well as beautiful, saving you recurrent maintenance and replacement costs.Changes made during construction turn out to be much more expensive than changes that can be made by an architect on paper. Additionally, the resale value of your property is higher when well-designed; and this is an important factor if you ever decide to sell in the future. Beyond the training, expertise and education required, architects also have vision. Their ability to expand ideas gives you a broader view of your own vision of your project and help you to imagine things that you hadn't thought of before. Architects value design and are trained to envision an end product that doesn't yet exist. They start off with what looks like random markings on paper. But these markings represent attainability. They enable us to see what isn't there yet. This helps us to picture the possibility of our project. When it comes to house design, you could think of this as a complex puzzle where all of the rooms and spaces inside and outside the house are the individual pieces. To solve the puzzle, someone has to figure out how to fit the rooms together to get the right flow of spaces. Someone has to think about how you are going to get the groceries from the garage to the kitchen as quickly as possible. Where will the powder room be so that it's convenient and private for guests during dinner parties? Where can your children rest their bags and lunch kits when they come home from school without cluttering the living areas? It isn't easy to get all of these factors to come together in a house that looks like your vision of your perfect home. You need someone who can see "the big picture" and can make sure all the pieces fit together in the most efficient and pleasing way possible. Hiring an architect gives you that person to unify the aesthetics of your home. He or she can figure out how your house should look and feel while being mindful of the practical requirements of actual construction. 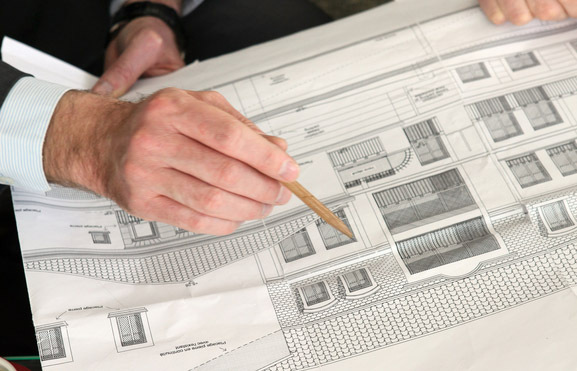 Beyond a deeper understanding of the processes, the guidance of an architect can ensure that your renovation and building dreams come true (sometimes exceeding your own expectations) and with the added bonus of saving you both money and your sanity. TIP: Ensure the architect you choose is a member of the Trinidad and Tobago Institute of Architects and registered with the Board of Architecture of Trinidad and Tobago. To find a list of architects on thebuildingsource.com click here.